The latest Dreamworks computer generated movie blasts its way onto the giant IMAX screens in Monsters vs Aliens 3D that combines state of the art computer generated images with the stunning 3D graphics. Monsters vs Aliens 3D revolves around Susan Murphy (Reese Witherspoon) whose wedding day is ruined when she is hit by a meteor from outer of space. Although she survives the impact, she still manages to make it to the church until she begins to grow uncontrollable and eventually demolishes the church after she reaches a height of 49 feet and 11 inches. Her husband to be Derek Dietl (Paul Rudd) would rather flee as marrying a 49 feet and 11 inches woman would be detrimental to his occur as a news anchor or so he believes. After the incident Susan is then captured by a secret military agency that has been "removing" monsters from the world and she is given the monster name of Ginormica. General W.R. Monger (Kiefer Sutherland) explains to Susan that she is to remain in this secret base in order to keep the existence of monsters hidden from the world of mankind. Saddened by this news, Susan is then introduced to a group of down and out monsters that includes a blob like creature called B.O.B. (Seth Rogen), a super intelligence cockroach called Dr. Cockroach Ph.D. (Hugh Laurie), a lizard man called "The Missing Link" (Will Arnett) and finally a gigantic insect called Insectosaurus. Unlike the stereotypically "monster" image, all are actually quite friendly, even the cute Insectosaurus. Unbeknown to this group of monsters, they are about to be thrust into the spotlight when an alien called Gallaxhar (Rainn Wilson) wishes to "steal" the power from Susan in order to make an army of clones to overrun the Earth. From here, the Monsters are the Earth's only hope in this entertaining film that can be watched by children of ALL ages. 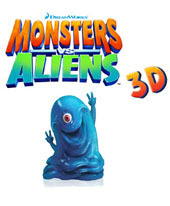 Monsters vs Aliens 3D features everything you would expect in this genre that include action, adventure, "romance" and best of all, a healthy dose of humour. The actors really lend themselves well to the characters, whether it's Reese Witherspoon as the questioning girl who eventually steps into her shoes as a hero, Seth Rogen as the forgetful and entertaining B.O.B. or Kiefer Sutherland as the rough and militaristic General W.R. Monger that may seem like a hard man but actually has a heart of gold. Of course, the stars of this movie are the computer generated characters themselves which simply look amazing on the big screen. On IMAX, Monsters vs Aliens 3D is a visual treat that simply looks phenomenal on the huge screen and match that with 3D and it's almost like being part of this computer generated movie. The colours are extremely vibrant with brilliantly clear images that is matched equally well with the IMAX sound. Needless to say, this is how computer generated movies should be experienced and I would highly recommend that you see this movie on the giant IMAX screen!